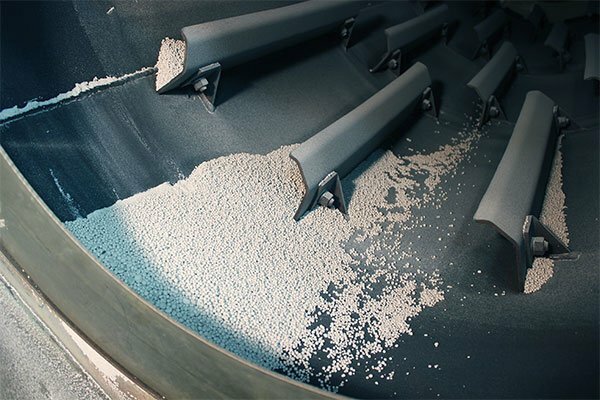 The field of bulk solids is incredibly diverse, encompassing industries ranging from food and pharmaceuticals to fertilizers and process by-products. 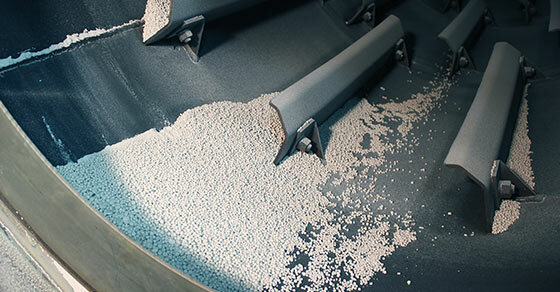 Processing bulk solids into a ready feedstock or end product can involve an array of process techniques, from crushing and mixing to high temperature techniques and more. Despite the diversity of the industry, however, drying and cooling remain a critical step in most bulk solids processing operations. And while a number of industrial drying and cooling systems are available on the market, when it comes to processing bulk solids, some materials are better served through the use of rotary dryers and coolers. Why Rotary Dryers & Coolers? Rotary dryers and coolers are high capacity systems, capable of processing anywhere from 1 TPH to 200 TPH plus. This makes them essential in high volume production settings, a typical requirement of processing bulk solids. Rotary dryers and coolers are known as the workhorses of the industry; it is not uncommon for rotary equipment to provide reliable processing for decades, courtesy of their robust build and engineered design. These dependable machines are low maintenance, low power, and high efficiency. Rotary dryers and coolers are also a preferred means of processing due to their tolerance in feedstock variation; while many systems require a uniform feedstock with a tight window of size and/or moisture range to ensure a uniform result and seamless operation, rotary equipment is capable of accepting variance in feedstock, while still producing a uniform product. In many cases, variance in feedstock can bring a production line to a standstill if the right dryer is not chosen; rotary dryers and coolers ensure seamless, reliable operation, despite variance in feedstock. Rotary dryers and coolers are highly customizable machines. Both systems can be provided in a direct or indirect configuration, and are often customized around the unique process and material requirements of the project at hand. Rotary dryers and coolers operate on similar principles, with the heating or cooling medium being the main difference. A large, rotating drum is used to tumble materials in the presence of a process gas or chilled air stream. Flights, or material lifters, pick up the material and drop it through the drying or cooling medium to maximize heat transfer between the process air and the material. While rotary dryers can be designed to be co-current (parallel) or counter-current in air flow, rotary coolers are always counter-current to ensure an efficient processing solution. The tumbling action imparted by the rotating drum can help to polish and round granules when working with agglomerates, creating a premium product. 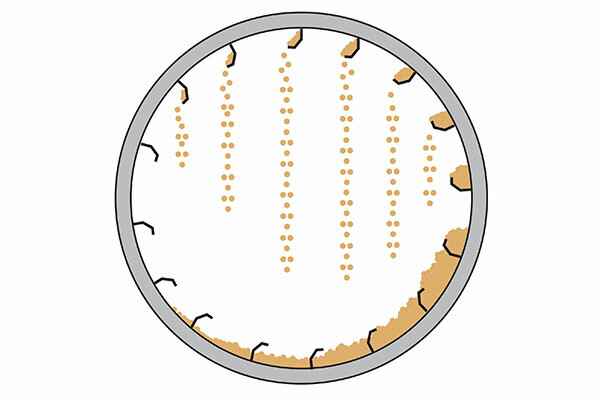 The image above shows how flights pick up material and drop it through the air stream to create a showering motion referred to as a “curtain” of material. Bulk solids span across nearly every industry. Rotary dryers and coolers can offer benefits over other systems in nearly every application that requires bulk solids to be dried or cooled. Some applications, however, are simply best served by rotary equipment, whether that be because of the particle size distribution, variation in moisture content, or the simple reliability of the design. Rotary dryers can be used to process dairy manure digestate from anaerobic digesters in order to produce a highly effective bedding product known as Dried Manure Solids (DMS) bedding. While this is a newer industry, DMS bedding is quickly gaining traction in the agriculture industry for the many benefits it can offer over other traditional types of bedding. There exists a large overlap between the mining sector and the agriculture industry, due to the extensive use of mined minerals in soil amendments and fertilizers. As such, many of the same materials can be considered, including limestone, gypsum, potash, phosphate ore, and more. Bulk solids in the mining industry demand heavy duty equipment. Harsh processing environments and rough, abrasive materials necessitate the use of rotary equipment for a reliable drying or cooling system. Moreover, the high capacities of rotary equipment combined with the given variability often associated with mined materials makes rotary dryers and coolers the obvious choice for this industry. 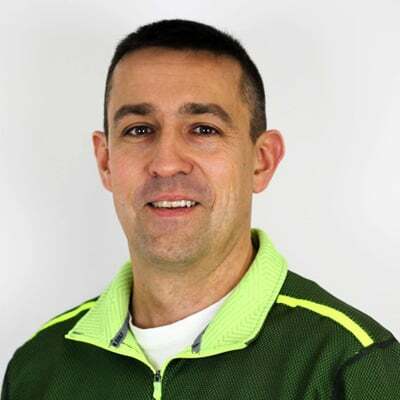 Biomass materials can vary across types as well as within the same source of material, requiring a reliable processing solution when variance is the standard. For this reason, rotary equipment is the preferred system in this setting. The rotary dryer is the industrial drying system of choice for sugar producers around the world. Sugar is prone to clumping and sticking together; the tumbling action, combined with the showering action from the flights, helps to break up any potential clumps. The variation that can occur with sugar feedstock is also a factor that demands a rotary dryer over other industrial dryer types. Furthermore, rotary dryers can be fabricated using stainless steel, a requirement of food-grade equipment. Rotary dryers and coolers are essential in the bulk solids processing industry, providing a high capacity process solution that is reliable, customizable, and offers seamless operation and a uniform product when variance in feedstock is present. Because of this, rotary dryers and coolers have become the system of choice for a number of applications in the agriculture, mining, biomass, and even sugar industries. Most often, the choice for a bulk solids drying or cooling system comes down to rotary or fluid bed. While rotary equipment is especially suited to demanding applications, fluid beds are more suited to materials that are especially delicate. 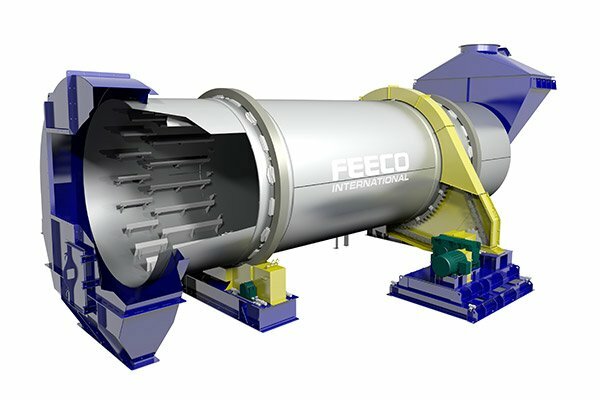 FEECO has been providing heavy duty, reliable rotary dryers and coolers since 1951. With installations all over the world in various process settings, our experience around designing custom rotary dryers and coolers is second to none. We also offer a unique testing facility where we can test your material at both batch and pilot scale to aid in process development and develop a recipe for process scale-up. For more information on our dryers and coolers, contact us today!